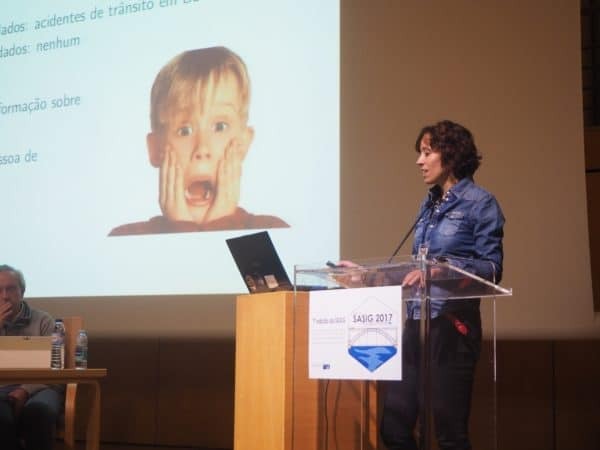 JIIDE and SASIG, in Portugal - GeoCat B.V.
During the month of November, two important events in the scope of SDI and FOSS4G took place in Portugal: JIIDE, in Lisbon, and SASIG, in Porto. The JIIDE – “VIII Jornadas Ibéricas de Infraestruturas de Dados Espaciais” is a yearly event focused on topics related to the development Spatial Data Infrastructures in the Iberian Peninsula; its location alternates between Portugal and Spain, and this year it took place in Lisbon, hosted by the “Direção-Geral do Território”. As expected, the implementation of the INSPIRE directive got a lot of attention from the speakers. Different national and regional authorities have discussed their solutions and challenges for meeting the INSPIRE implementation, in the agreed deadlines. Geocat delivered a talk about Live – “Uma Solução INSPIRE-ready para a Publicação de Dados na Cloud” – in a session about INSPIRE tools. In this session other cloud-based SDIs were presented, which sets the idea that cloud solutions are understood as a “natural evolution” for running SDIs. However, it was not clear from the presentations which functionalities were there, which could help us in the implementation of INSPIRE, beyond generic SDI functionality. It was a positive surprise to discover that many people in the conference were actively using Geonetwork, although it was a bit disappointing to see that many of them are not involved in the community (e.g. : don’t participate in mailing lists, user groups, etc). This lack of involvement can lead for instance to the private development of functionality, which is already being developed by others. In order to take advantage of the “momentum”, Geocat organized an “informal” Geonetwork users meeting, but unfortunately due to the late schedule not many people turned up. The last day of conference hosted the ENIIG,“2º Encontro Nacional de Infraestruturas de Informação Geográfica”. This event proposed a series of very interesting workshops, including one about “Complex Features with Geoserver” by one of the Geosolutions developers (Nuno Oliveira) and another about “Hale Studio – INSPIRE Data Transformation” by one of the developers from Wetransform (Andreas von Dömming). Noticing the lack of awareness about contributing to FOSS, OSGeo-pt decided to present a workshop about this topic; we consider this workshop a major success, as it had a large number of registrations (and attendances) and a FOSS4G user group was “born” during this workshop: “geoinquietos-lisboa”. Overall it was interesting to catch up with what is going on in the field of SDIs, specially in Portugal where a lot of things seem to be happening in recent times. It was also very positive to notice that there is an increasing openness from the “Direção-Geral do Território” towards FOSS, and that they are keen on implementing solutions which can be later reused by regional and local authorities. The SASIG – ” Encontro Nacional de Software Aberto para Sistemas de Informação Geográfica”, took place in the following week, in Porto. This event is organized by OSGEo-pt and is mainy focused on FOSS4G. In this edition, apart from the ever-present technology discussions, some attention was given to the collaborative nature of FOSS. It was a bit disappointing to see that a few speakers used the talks as “sales pitches”, and presented work which they did with FOSS, without ever contributing back to the community; as it happen in the JIIDE, we got the impression that a few people have a lack of understanding regarding the dynamics of the free and open source community and the associated business model, and maybe this is a topic that should really get our attention on the next SASIG. Regardless these “inconveniences”, there were many interesting presentations, which show that a lot has been done in the FOSS4G panorama in Portugal, often by volunteers in their spare time. It is worth to mention the extraordinary presentation of Pedro Venancio – “Open Source, Open Data e Citizen Science” , a data science analysis of the unfortunate fire in Pedrogao Grande, last summer in Portugal. There many presentations around the topics of “Open Data” and “Citizen science”, and this is probably a novelty regarding previous editions SASIG. Geocat was very present in this SASIG, as Joana Simoes is involved in OSGEO-pt. Apart from proudly supporting the event through sponsoring, we contributed with three presentations: about metadata, the OWC geopackage extension, and FOSS technology. We also contributed with a Workshop about Geonetwork which was fully booked, showing that there is a lot of interest in this software in Portugal. Most of the people in the workshop were already using Geonetwork, and most people who were using older versions wanted to move to version 3x. The students were very motivated and hopefully they could take something out of this workshop, which will enable them to develop their SDIs with Geonetwork, at their workplaces. The overall feeling of SASIG is very positive: there are more and more local authorities and government agencies adopting FOSS4G in Portugal. However there is still a lack of “contributing” culture, which does not only affect code, but also other aspects such as the sponsoring of this type of event. As OSGeo, we hope to build on the “lessons learned” from this event and organize a very successfull FOSS4G Europe, in July. As Geocat, we look forward to support and be involved in the next SASIG. My final thought goes to the lack of overlap between the crowd at JIIDE and SASIG: very few people were presents in two events which ave some degree of overlap in terms of topics, and are very close in time and space. Maybe this could be an incentive to bring the two communities closer, in the future.